An inter-parliamentary working group has been formed that will study the feasibility of nuclear waste imports into Russia from the European Union for recycling and storage. 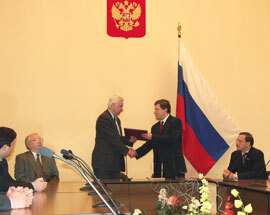 Chairman of the State Duma Committee for Education and Science Alexander Shishlov (the Yabloko faction), now at Strasbourg at the session of the Parliamentary Assembly of the Council of Europe, had a meeting on June 24, 2002 with the Director General of the Department for Education, Culture and Heritage, Youth and Sports of the Council of Europe Benedict Rugas and the Head of the Committee for Higher Education and Science Szhur Bergan. The Yabloko faction succeeded in passing a number of principle amendments to the draft law "On Combating the Extremism "
The Yabloko faction succeeded in passing a number of principle amendments to the draft law "On Combating Extremism" which was adopted by the State Duma in the second reading on June 20, 2002. The Yabloko faction in the State Duma thinks it necessary to adopt a law "On Combating Extremism" "in view of the outbreak of extremism and signs pointing to the formation of an extremist underground in Russia." This statement for journalists was made by Sergei Mitrokhin, a member of the Yabloko faction. June 7 is a tragic date in the history of Russian journalism. Four years ago on this day Larissa Yudina, Editor-in-Chief of the "Soviet Kalmykia Today" newspaper, member of the Kalmyk regional branch of YABLOKO, was brutally murdered in Elista. She died from at the hands of murderers, while performing her journalist duty fighting corruption in the republic. On June 7-8 Chairman of the Russian Democratic Party YABLOKO Grigory Yavlinsky will participate in the annual working conference of the “USA-Italy” Council, which was created in 1991 to promote the relations between the USA and Europe. Deputy Speaker of the State Duma from the Yabloko faction Vladimir Lukin, thinks that the recent summit meetings between Russia and the USA, NATO and the European Union represent a "step forward rather than a breakthrough." Grigory Yavlinsky, leader of the YABLOKO party, is against the introduction of political censorship in the media and stamps as "distorted" the data of a recent public opinion poll on introducing censorship. The Government of Russia "should proceed from the fact that development of education is a priority" when drafting the federal law "On the Federal Budget for 2003" as regards financing education, the State Duma Committee on Education and Science has stated. Moscow, Ministry of Justice, May 22, 2002.